Let’s introduce you to our next-generation indoor / outdoor speaker family called the FS Series and explain why they are the ALL-PURPOSE solution for your everyday installations. The FS Series is built upon AtlasIED’s proven success with their larger predecessor, the AH Arena Horn Series. The AH Arena Horns are installed in thousands of outdoor installations around the world and are still functioning perfectly after 10+ years of operation. While the AH horns are still great for heavy-duty long-throw needs, the FS Series stands out as an ALL-PURPOSE solution as they work perfectly for most indoor and outdoor projects. They are both LOUD and LIGHTWEIGHT. The FS Series is engineered to be an installer’s “mix and match” solution, tuned for optimal source reproduction. They share the same two-way transducer design incorporating a consistent high-output 12" LF driver (at 800W program or 400W continuous). Our engineers chose a 12” driver because it’s the best cone diameter for optimized speech intelligibility within the critical mid-range frequencies, while also being large enough for extended low-frequency response for music reinforcement. 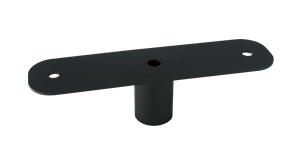 As a two-way speaker design, these models incorporate a 2” compression driver that’s concentrically located and mounted to a controlled directivity waveguide. The fourth model is a high-output, low-frequency subwoofer. It incorporates a high-output 12" LF driver (at 800W program or 400W continuous). 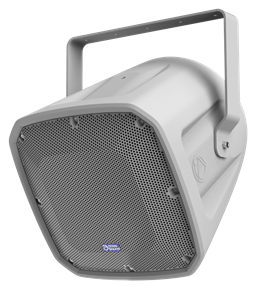 The fifth and final model is a near-field version with a two-way, coaxially mounted transducer with a (400W program or 200W continuous) 12” LF driver and 1” dome tweeter providing a conical 90° coverage pattern. This model is best used when you require a shorter distance solution such as a down fill with a wide coverage pattern. This is also an ideal model for high-ceiling indoor applications. Watch the video to view the performance chart; FS Series can achieve 96 dB sound pressure level at 140 feet with smooth sounding speech and music reinforcement and up to 550 feet at 84 dB for paging only applications. Most horns compromise full-definition audio to achieve further distance coverage. They support speech frequencies only and are best used for paging and low-level background music applications. The FS Series is unique as it does deliver extended distance range like a horn, but it also provides full-definition frequency response for use in live sound and high-energy music playback applications. Another impressive aspect of the FS Series is the remarkably small enclosure footprint for such a powerful speaker. Its slim format greatly improves sight lines and blends into the environment. The compact size also minimizes wind resistance when mounted on an outdoor pole, wall or on top of a building. Each model shares the same housing and maintains a consistent appearance. The enclosure is constructed using molded linear low-density polyethylene known as LLDPE. It is fully weather-proof, UV, and chemical resistant. LLDPE’s low density molecular structure also delivers superior toughness and rigidity, which minimizes acoustic resonances from the enclosure walls, achieving better sound performance. The LLDPE is also light-weight enough for a single person to lift, creating a labor savings too. If that’s not enough, it has long-term reliability due to its incredible composite strength and will not stress-crack like a wood enclosure. The enclosure color is a medium grey with a slightly cool tint known as “battle ship grey”. This is the same color that naval vessels are painted, and it is less visible against the sky on a sunny or cloudy day. It is also a nice neutral match for both light and dark colored indoor decors. Battle ship grey also visibly minimizes the appearance of bird droppings left behind. Keeping birds, rodents, and insects out of the speaker, the front features a rust-free powder coated aluminum grille with a nylon foam mesh. Carrying a worthy level of weather and dust protection, the FS Series is IP Rated IP-45 when tilted downwards at 5 degrees. At AtlasIED, we recognize that after many years of heavy, loud use, in harsh weather environments, a speaker may require some servicing. If it ever does, we’ve made the process stress-free. The enclosure and grill are designed for easy field service. You WOULD NOT have to remove the enclosure from its mount. You can access all the internal components though the removable front grille and service any parts, if needed. To ensure servicing occurs in extremely rare cases only, AtlasIED offers OverGUARD speaker protection. This internal circuitry ensures your FS Series speakers are safely guarded from damage caused by continuous overdriving. You get many years of worry-free operation and it’s included in all models. No extra set-up or peripheral equipment required. Power and Process using the DPA Series Multi-Channel Amplifiers incorporating Onboard DSP and optional Dante™ card. The DPA Series is an installers "everyday use" amplifier. You can stock in your inventory and it can be dynamically configured to meet the design requirements of any installation. DPA Series has a total of five models to meet exact power needs. There are two four-channel versions handling 70V/100V and/or 4Ω or 8Ω loads. Plus three hybrid models, factory preconfigured in a two-channel 70V / 100V mode. If the design requires four channels of low impedance amplification, the amplifier can be configured as 4-channel model with either 4Ω or 8Ω load impedances. Many system designs require both low and high impedance amplification. The DPA Series can be configured to deliver 70V / 100V for a paging / background system on a single channel plus two additional 4/8-Ohm amplifier channels for a foreground stereo application.